When Ron Mack of East Grand Forks had a stroke several years ago, he needed more physical therapy than his insurance provided. 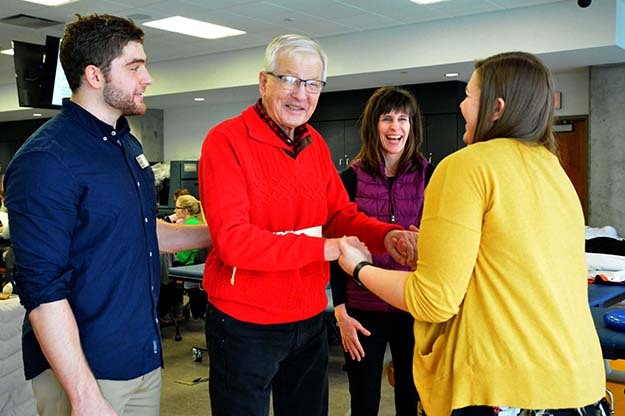 He found help at UND’s pro bono physical therapy clinic, where students worked with Mack to improve his walking and balance. Mack continues coming to the clinic, which is held for eight weeks each fall, for physical therapy. The clinic is held in the physical therapy lab at the new School of Medicine & Health Sciences. 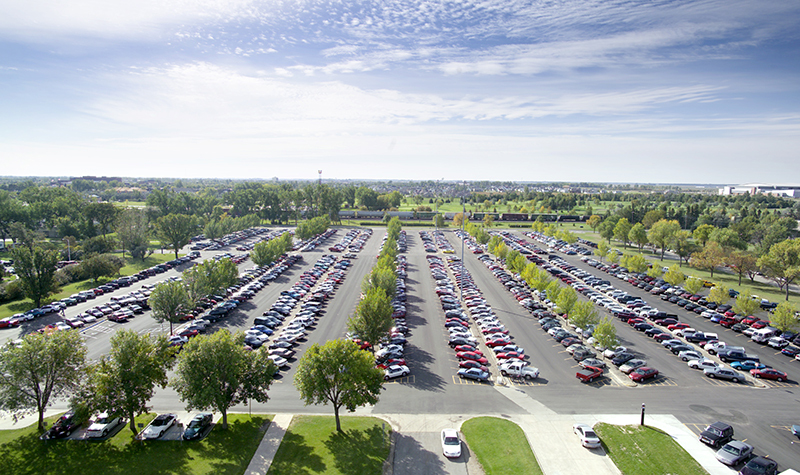 Since 1998, the clinic has put UND’s mission of teaching, service and research into action. Located in a new spacious, light-filled lab at the School of Medicine & Health Sciences, the clinic gives students experience with patients while supervised by faculty, helps patients be more mobile, and also offers research opportunities for faculty. 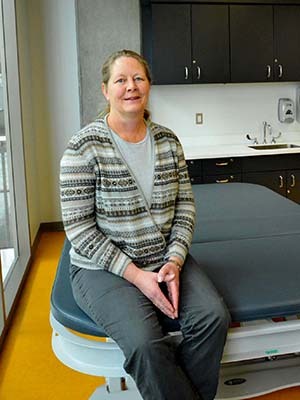 “The clinic helps students get ready for clinicals, interact with community members and provides services you can’t get elsewhere,” said Cindy Flom-Meland, associate professor of physical therapy and director of clinical education of physical therapy. The clinic, which doesn’t compete with other health care providers, serves patients without health insurance or whose benefits have run out. Patients are often referred to the clinic by other providers. Clients have neurologic diagnoses that can include stroke, multiple sclerosis, traumatic brain injuries, cerebral palsy, Parkinson’s disease and spinal cord injuries. Clients range in age from 20 to 80. “We provide therapy to help clients be active, reach their goals, and hopefully have a positive effect on their quality of life,” said Flom-Meland. The clinic also brings research into play. “From a medical standpoint, we need to be able to prove that what we’re doing is effective,” Flom-Meland said. “UND physical therapy students have the opportunity to learn about and take part in research.” Faculty and students have worked with other departments on campus, presented their research at national conferences, and also invite physical therapist assistant students from Northland Community & Technical College in East Grand Forks to take part in the clinic. “We’ve had fabulous results, and students learn to interact with different professions,” she said. 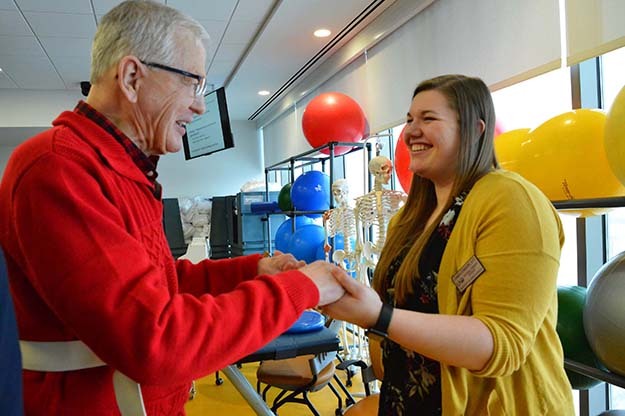 “This is an excellent integration of education with community service,” said Dave Relling, associate professor and chair of physical therapy, adding that the department is celebrating its 50th anniversary this year. 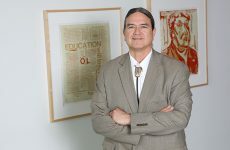 Relling said the department is active in the Grand Forks community, and students and faculty volunteer for programs such as Bone Builders at the Grand Forks Senior Center, Rock Steady Boxing at the YMCA for patients with Parkinson’s, Spin for Kids, and the Stepping On senior fall prevention program by NDSU Extension and Altru Health System.